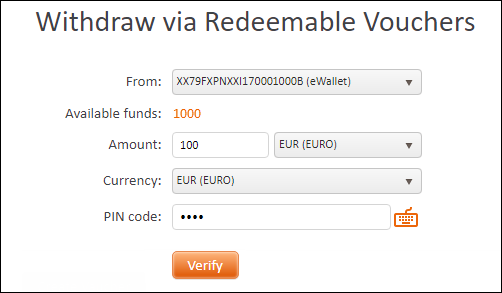 Select Withdraw Funds → Create FXOpen Voucher in My FXOpen. Amount: Enter the amount you want to withdraw and select the currency pocket. Currency: Select the currency in which you want to withdraw. PIN code: Enter the PIN code for eWallet, and then click Verify. Security code: Enter the security code, and then click Verify. Learn more about how to confirm withdrawals with a security code. Our Finance Department will process your withdrawal request within 24 hours. Withdrawal requests placed on weekends will be processed on Monday. After your request is approved, a redeemable voucher will be generated. All redeemable vouchers are shown under the withdrawal form. If you need further assistance, please contact us at [email protected]. If your withdrawal request has not yet been processed, you can cancel it. Click your eWallet number on the left of My FXOpen, find the transaction in the transaction history, and then click Cancel. Click your eWallet number on the left of My FXOpen. The transaction status is shown on the History tab.